The South African DJ will perform Saturdays. Hï Ibiza, the club formerly known as Space (R.I.P. ), has just announced the line-ups for Black Coffee's Saturday night residency. The multi-platinum South African producer and DJ will perform every Saturday for 18 weeks, from 3rd June to 30th September. 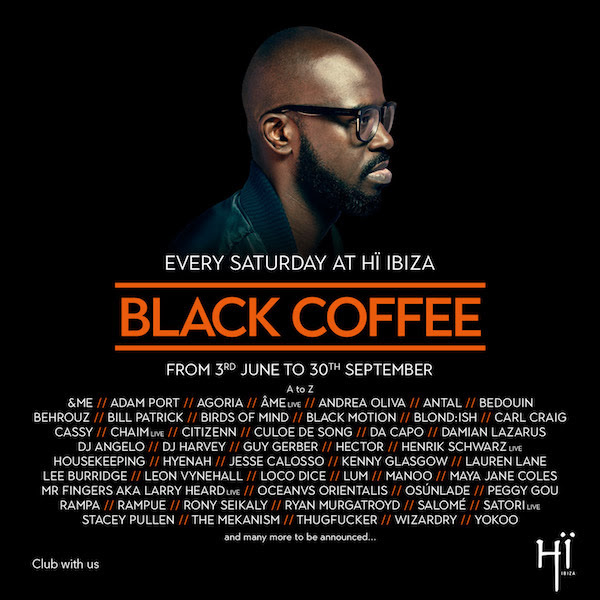 Supporting Black Coffee for his debut Ibiza residency is a stacked lineup of Ibiza regulars including, &ME, Âme, Blond:ish, Carl Craig, Cassy, DJ Harvey, Henrik Schwarz, Loco Dice, Maya Jane Coles, Mr. Fingers aka Larry Heard (live), Stacey Pullen, plus a group of hand-picked South African underground talent including Culoe de Song, Da Capo, Black Motion, Hyenah, Ryan Murgatroyd.